Region: With exception to the South, This beetle can be found throughout North America. Life cycle: One to tree generations per year. The adults hibernate in the soil. Physical description: The adult is a yellow beetle with black stripes on the wing covers and dark dots just behind the head. It has a hard shell and a broad, convex back. The average length is about 3/8 inch long. The larva is a humpbacked, dark red with black legs and head, which changes to pink or orange with two rows of black spots on each side. The eggs are orange and are laid in rows under leaves. Feeding characteristics: The beetle feeds on leaves and may defoliate potatoes. 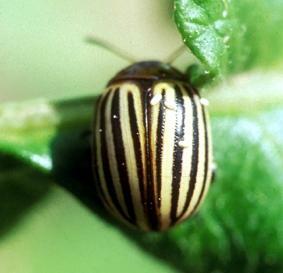 They are especially harmful to home gardeners with small plantings and are often called potato bugs because they are so common. Controls: You can mulch well with about a 1-foot layer of clean straw or hay, or if necessary, spray with rotenone. However, one of the easiest and very effective ways of avoiding this beetle is to grow your potatoes above ground. Drop seed on the packed leaves from the previous fall, and cover the garden area with a three-inch layer of straw and add a cup of bone meal over each seed potato. Then add more straw until the garden is covered by about a foot, making sure it is uniform. The vines will eventually grow through the straw, leaving the beetles behind. You will then start to notice bulges in the mulch, which are the tubers that are growing under a protective layer.